Mister Sack is your strong arm against floods. When water worries, the bag grows like a muscle, from 0,5 kg to 20 kg in few minutes with water, protecting you from the danger. The key factor during flooding is the timing. Once wet, the bag can be easily placed from everyone within 5 minutes. 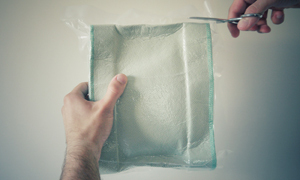 Depending on the situation the bag can be placed inside or outside the house on top of the plastic film supplied. Mister Sack is the first 3d bag in the market. This gives stability and adherence. Moreover the size is perfectly adaptable for every door. Mister Sack is vacuum packed to guarantee the quality of the produt in the long term. For this reason it can be stored for years. Mister Sack can be used many times storing it on top of the plastic film supplied. For the disposal it has to be exposed to solar rays untill it becomes dry. The certified product inside of the bag is used in agricolture. Just if Mister Sack has absorbed freshwater, the internal dose can be mixed with the ground to make it more fertile. Mister Sack is principally used as tool to fight heavy rains and floods but it can be useful also for little domestic leaks or to stop liquid flows. Water bomb are frequent nowadays and Mister Sack can be a great solution for resting easy. The bag can be useful also for little domestic incidents like washing machine leaks. In this case Mister Sack can be used as a big sponge. When water goes out from a manhole or from a WC, the bag can be wedged into the cavity to stop the liquid flow. Pay attention to open the vacuum pack and look at the general information on the bottom of the box – you can also download them here. Wet the bag in a sink or in a bucket until it is well-laden. During the loading process guide with your hands the internal dose throughout the sack. Place Mister Sack with energy over the supplied PE film adhered to the walls. 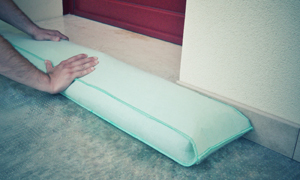 It can be put inside or outside the door depending on the situation. from Monday to Friday, 8.30 am to 12.30 am, 2.00 pm to 6.00 pm. Call or write us, we will respond as soon as possible. Look at the FAQ for more informations.